← Do you love treehouses? I say it again and again – kayakers are cool. I get the chance to kayak a lot on my travels, and kayaking guides are, nearly without exception, fun to be with, informative, caring and sharing. 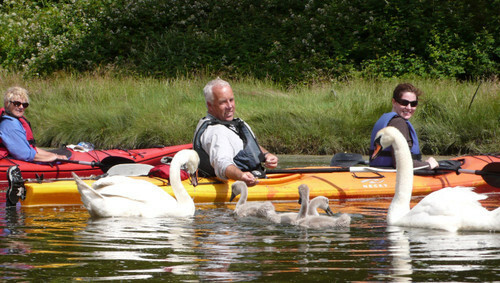 And these guys, Atlantic Sea Kayaking, based on the cove-a-licious coast of West Cork, Ireland, are top of my list. Not only are they superb activity ambassadors in my native Ireland, but they also run trips to Mexico every winter. It is this connection with Mexico which led to their founders, Jim and Maria Kennedy, being honoured recently by the Mexican government and receiving the highest award that can be bestowed on a non Mexican, The Ohtli Award. This special honour is awarded by the Mexican government to individuals for promoting Mexico abroad. “Ohtli” is the Aztec word for pathway. It has only ever been awarded worldwide to 250 people outside Mexico. Last year’s recipient was the Irish music legend Paddy Moloney who, along with the Chieftains and Ry Cooder recorded the album “The St Patricios” commemorating the Irish Regiment who changed their allegiance and fought with Mexico against The United States in the War of Independence. The award was presented by the Mexican ambassador, Carlos Garcia De Albo during the Mexican Independence Day celebrations at the Clyde Court Hotel in Dublin and was witnessed by about 1000 guests of the embassy including The Lord Mayor Oisin Quinn, many ambassadors of other countries as well as family and friends of the Kennedys. Through their business Jim and Maria are directly responsible for hundreds of Irish people over the last 25 years having an unforgettable trip of a lifetime to Mexico, and indirectly probably thousands more through their promotional talks and video presentations over Europe. 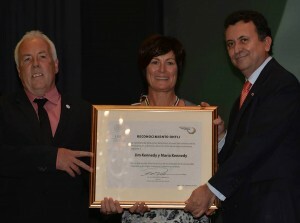 This award means that Jim and Maria Kennedy will be lifelong ambassadors and promoters of the delights and charms of Mexico and will continue to forge new links to connect Ireland and Mexico. They will also be lifelong friends of mine, having welcomed my son into their Irish fold during the summer to learn more about kayaking and help out on one of their famous summer camps. And in the process, they put him on his own pathway to loving life on the water. As the Mexicans have rightly recognised, kayaking with the Kennedys takes you on a sustainable and very special journey. Atlantic Sea Kayaking’s next scheduled tour in Mexico will be February 2014 to witness the Grey Whale migration from Canada. In the meantime, if Cork is closer, get yourself down to their cove. This entry was posted in Articles and tagged Atlantic Sea Kayaking, ecotourism Ireland, kayaking, kayaking Ireland, kayaking Mexico, Mexico, sea kayaking, Wild Atlantic Way. Bookmark the permalink.